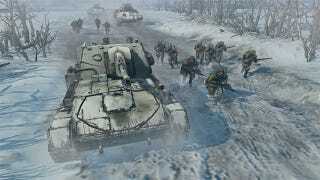 Company of Heroes is a franchise that prides itself on several things. For one, it's a well-regarded real-time strategy game. For another, historical accuracy is paramount to developers Relic. This means weapons and vehicles are true to history, and the snowy weather has an actual impact on your game. But it's more than just that. In 1941 Stalin issued Order No. "Not A Step Back" 227, forbidding retreat on penalty of death. Though brutal, it did manage to push Germans off of the Soviet Union's lands. Keeping in line with the history of Russians versus Germans, then, means that retreating from battle on the Eastern front will get you shot by your own army men. After showing off a few new features that Stephen saw during his demonstration—like a new line-of-sight feature, and being able to have your men vault over cover—our Russian soldiers were trapped, pinned down by heavy German fire. What could they do? An order was called for the men to retreat. A second line of Russian defense, witnessing this retreat, shouted at the infantrymen to stand strong and pursue the fight. The scared men kept running, and a cut scene showed them being gunned down. It was an uncomfortable cut scene to watch. But this is exactly why Relic chose the Eastern front setting in the first place: because it's the bloodiest conflict in history, seeing 20 million Russian deaths.